Leafcutting Bee, common name for bees that use pieces of leaves or flower petals to construct their nests. Leafcutting bees are found throughout the world. About 140 species occur in the United States and Canada. The term leafcutting bee also refers to a large number of related species, not all of which build their nests with leaf pieces. In the entire group, there are over 3000 species worldwide and more than 600 species in the United States and Canada. Leafcutting bees are black bees with white or silvery hairs, and the top of the abdomen may have fine bands of white hairs. The underside of the female's abdomen has a dense brush of hairs that is used for carrying pollen. Males are usually smaller and in many species they have hairier faces than females. The bees range in size from small to moderately large, usually 1 to 2 cm (0.4 to 0.8 in) long. A few species of leafcutting bees are communal-that is, several females share a common nest entrance but construct nest cells and tend their own brood separately. Most species are solitary and each female constructs her own nest independently. Many species form dense aggregations of individual nests. Most nest in preexisting cavities, such as hollow plant stems, hollow trees, old mason wasp nests, bird nests, snail shells, insect galls, and holes in wood created by boring insects or by nails. One group of leafcutters is known to excavate their own nests in sandy soils. The alfalfa leafcutting bee was introduced into the United States from western Asia in the late 1930s for the commercial pollination of alfalfa plants. This bee is specially adapted for foraging on alfalfa flowers, which honey bees tend to avoid. These small flowers must be pried open by the pollinating insect, which then gets dusted with pollen by the flower's spring-loaded anthers. The alfalfa leafcutting bee is managed intensively for alfalfa pollination in Washington, Oregon, California, Idaho, and Montana. Production of the bees is a multimillion dollar business in the United States and Canada, and it is also important in Russia. Each female alfalfa leafcutting bee uses about 15 leaf or petal pieces to construct a brood cell (compartment for young). The bee stocks the cell with pollen and nectar, lays an egg on the pollen, and then seals the cell, leaving the larva to grow and develop into an adult bee. A linear series of such cells is produced in a nest hole 6 to 8 mm (0.25 to 0.31 in) in diameter. Each female may produce up to 40 offspring, but usually produces about 12 to 16. Most nests are made in the spring and the subsequent generation does not emerge until the spring of the following year. However, some females emerge after only a few weeks and make a second generation of nests in the same summer. Alfalfa leafcutting bees are parasitized by fungi, other bees, and wasps. 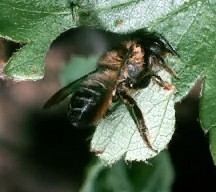 Leafcutting bees occasionally cause damage to certain ornamental plants, such as roses, if large numbers of females are nesting in one area. The damage, however, is usually slight and temporary. Growers can protect plants by covering them with screen or gauze while the bees search elsewhere for their nest materials. Scientific classification: Leafcutting bees are classified in the genus Megachile of the leafcutting bee family Megachilidae, order Hymenoptera. The alfalfa leafcutting bee is Megachile rotundata.